A breakdown of the ills caused by the bottled water industry, from economic, environmental, and health perspectives. The infographic assembles a great collection of shocking facts about the bottled water business. The information itself is captivating, and the graphics, while not exactly beautiful, help get the message across. The core of the information is quantitative, so the graphical elements do well to offer support. 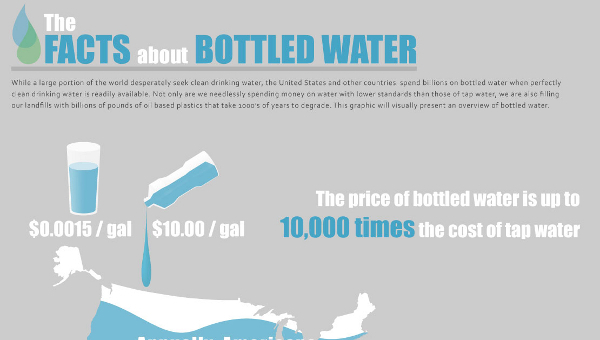 The infographic is a solid wake up call to those unfamiliar with the ills of the bottled water business. This isn’t the kind of thing they teach you about in school or university, so sometimes it’s important to pay attention to those online lectures to get the facts. The design takes up a bit too much space for what it shows, but only a bit. While it does a great job of diagnosing the problem, it doesn’t present much in the way of solutions (like using a Brita home filter). Also, much of the reason people buy bottled water is for a convenience in having water on the go, when you don’t have your own tap there ready. It’s often the only alternative to soda/soft drinks, and in many ways the lesser of two evils. Finally, while there are regulations to keep pipes and city water clean, your home water is significantly affected by your own pipe and plumbing system, which could do a lot of damage to it. Worth considering. Honestly, though, it would make for a less consistent and clearly focused infographic if it included these elements, so I don’t consider it a major criticism, but maybe a URL at the bottom that led to a page with further discussion would have been nice. That said, if you’re interested in more about water and the world, see the film FLOW: For Love of Water. It takes the themes seen in this infographic and expands them into a full length (and fully depressing) film. If you think the information in the infographic was rough, wait until you see the film. Water is a serious issue, and the film does a great job of making that fact clear. Found at Online Education here. This entry was posted on January 24, 2010, 10:56 am and is filed under Environment & Nature. You can follow any responses to this entry through RSS 2.0. You can leave a response, or trackback from your own site.